January 1933: Jackson Pollock is taught by John Sloan. January 30, 1933: Adolf Hitler is sworn in as Chancellor of the Third Reich. 1933: Modern Man in Search of a Soul by C.G. Jung is published in the United States. The book consisted of eleven papers, six of which were included in a 1931 German language collection on "soul-problems of the present time." 1933: William Baziotes moves to New York. 1933: Philip Guston's first exhibition is held at the Stanley Rose Gallery. February - August 1933: Barnett Newman rents a studio in Greenwich Village. Early 1933: Balcomb Greene returns to New York from Europe. American artist Balcomb Greene had first gone to Europe during the 1920s to study psychology in Vienna. In 1927 he returned to New York where he taught English at Dartmouth College and wrote fiction. He and his wife Gertrude Glass returned to Europe in late 1931 where he began experimenting with painting. After he and Glass returned to New York in early 1933, he wrote articles in Art Front (the magazine of the Artists' Union which began publication in 1934) and became the editor of that magazine in 1935 and 1936, later also becoming the first chairman of the American Abstract Artists. (He also wrote for the newspapers, Broadway Brevities and Graft.) As part of the WPA he did abstract murals for the Hall of Medicine in 1939 at the New York World's Fair and the Williamsburg Housing Project and designed a stained glass window for a school in the Bronx. In approximately 1940 he began doing a master's degree in art history at New York University and from 1942 to1959 was employed by by the Carnegie Institute of Technology in Pittsburgh as an art history teacher. One of his students there was Andy Warhol. 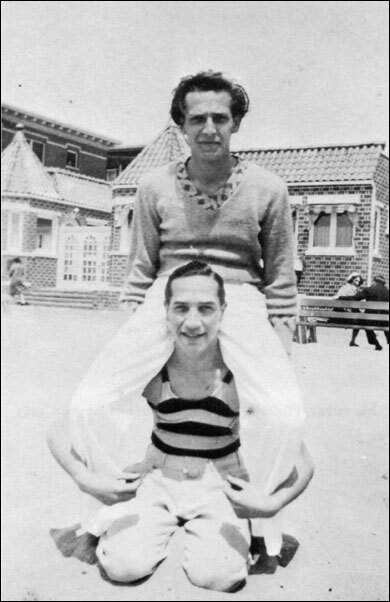 Greene and his wife commuted between Pittsburgh and New York and purchased property at Montauk Point, Long Island in 1947. His work was shown at J.B. Neumann's New Art Circle in 1947 and the Bertha Schaefer Gallery from 1950. 1933: Hans Hofmann opens his school in New York. Hofmann had previously had a school in Munich which he established around 1914, and had also taught summer classes in Bavaria, France, and Italy. Artists who studied with him in Europe included Carl Holty, Glenn Wessels, Vaclav Vytlacil and Worth Ryder. At the invitation of Ryder, he traveled to the United States in the summer of 1930, teaching classes at U.C. Berkeley. He returned to Germany where he taught classes the following winter and then returned to the states in the spring to teach at the Chouinard School of Art in Los Angeles and also at Berkeley (where he wrote the first version of Creation in Form and Color: A Textbook for Instruction in Art.) He moved to New York in 1932 and taught at the Art Students League. His students there included Burgoyne Diller, Harry Holtzman and George McNeil. February 12, 1933: Los Angeles police raid the John Reed Club. When the police raided the Los Angeles branch of the John Reed Club, they destroyed some mural panels that had been painted by Philip Guston and Reuben Kadish. February 24, 1933: Nazis raid the German Communist Headquarters. On February 24 an auxiliary police force organized by Göring raided the Communist headquarters, with Göring falsely claiming to have uncovered plans for a Communist uprising. What he had actually uncovered was the membership list of the German Communist party and he intended to arrest every one of the four thousand members. February 27, 1933: A fire breaks out at the Reichstag. On February 27, a fire broke out at the Reichstag building. The Communists were blamed although some were suspicious that the fire had been started by Hitler in order to justify his crackdown on subversives. 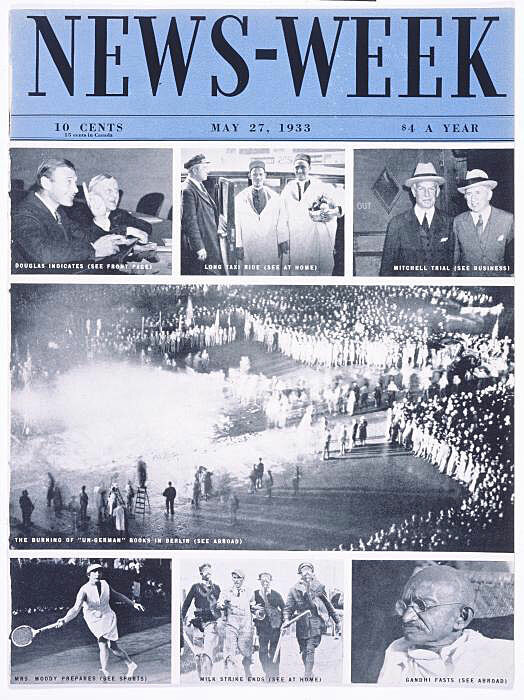 March 4, 1933: Franklin D. Roosevelt is inaugurated as President of the United States. March 1933: Diego Rivera begins painting his Rockefeller Center mural. March 6, 1933: Jackson Pollock's father dies. Several months before he died Jackson's father had returned to his wife (Jackson's mother) in Los Angeles. They had been separated since October 1920. Jackson's mother described his death to her sons. She had set up a bed in the dining room so he could look out the window. She remembered that he had listened to and enjoyed Franklin D. Roosevelt's speech and not long afterward developed trouble breathing. A doctor was eventually called and while the doctor was standing in the doorway Jackson's father looked up at his wife and said 'Mother, I don't think I can last till morning.' He died in her arms. March 21, 1933: The formation of the Dachau concentration camp in Germany is announced. On March 21, 1933 the Völkischer Beobachter newspaper announced "On Wednesday the first concentration camp with a capacity to hold 5,000 persons is to be erected in the vicinity of Dachau." The first prisoners were the political opponents of the Nazis including Communists, trade unionists, members of opposition political parties and Jews because of their opposition to the new regime. In the years to follow, the prisoners would also include Jehovah Witnesses and homosexuals. c. Late March/Early April 1933: Jackson Pollock drops out of the Art Students League. April 1933: Philip Guston shows Mother and Child at the Los Angeles Museum. April 1933: Jackson Pollock moves to 46 East 8th Street - and watches Diego Rivera paint Man at the Crossroads. April 24, 1933: Controversy erupts over Diego Rivera mural. 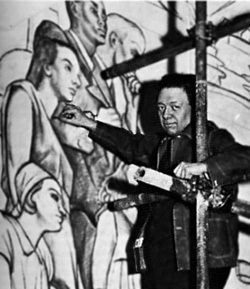 May 9, 1933: Diego Rivera is forced to stop work on his Rockefeller Center mural. Rivera was ordered to leave the scaffold on May 9th. The mural was covered and Rivera was forbidden to re-enter the RCA Building which remained open to the public with the mural covered from view. The wall would be resurfaced by workers on February 9, 1934, permanently removing the mural. (RS) After John Sloan suggested that the mural's removal was censorship, the New York Times defended the its destruction in an editorial published on March 18, 1934 under the title "Mural War Persists" in their "Topics of the Times" section. (RS) A "mural" was apparently not art whereas an "easel picture" was. May 9, 1933: George Biddle writes to President Roosevelt to encourage state sponsored art. May 10, 1933: The Nazis burn books. The first major 'book burning' by the Nazis took place on May 10, 1933 when about 20,000 books were burned during a public demonstration on the Opernplatz in Berlin at which Goebbels was a speaker. The books were from the Institut für Sexualwissenschaft (a sexology research institute founded in 1919 and headed by a Jewish doctor) and Humboldt University (Berlin's oldest university which both Karl Marx and Friedrich Engels had attended). The burning of books was repeated in various other cities of Germany around the same time. "The Burning of 'Un-German' Books in Berlin"
Summer 1933: Mark Rothko exhibits in Portland, Oregon. 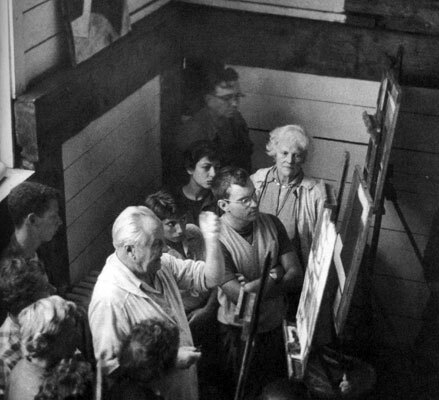 Summer 1933: Adolph Gottlieb and wife rent a place in East Gloucester. The Gottliebs saw Milton Avery and his wife, who were also in Gloucester, "everyday". (AG16) Milton Avery's wife, Sally, also recalls that Mark Rothko and the Averys "would go away for the summer together." End Summer/Autumn 1933 - c. May 1937: Mark Rothko and wife rent 1000 Park Place. Autumn 1933: Jackson Pollock moves to 58th Street. September 1933: Thomas Hart Benton returns to New York. On Monday nights the Bentons would host a musical evening. Thomas Hart Benton had started a band, the Harmonica Rascals, after trying a toy harmonica. He decide to collect folk songs on his trips across the U.S. Benton had worked out a system of musical notation where the notes were referred to as numbers. He collected hundreds of folk songs and his Monday evenings attracted numerous musicians, including Charles Seeger, whose son Pete said that he first heard the classic folk song, John Henry, when Benton played it on his harmonica accompanied by Charles. Jackson Pollock played the Jew's harp, after unsuccessful attempts at the harmonica. According to Thomas Hart Benton, Jackson "ran into some kind of 'bloc' about reading or playing notes." (JP68) In 1934 Benton painted Pollock playing the Jew's harp for his painting The Ballad of the Jealous Love of Lone Green Valley (1934). c. Autumn 1933: Jackson Pollock is hospitalised after a drunken brawl. October 14, 1933: Germany withdraws from the League of Nations. October 30 - December 8, 1933: "Edward Hopper: Retrospective Exhibition" at the Museum of Modern Art. November 1933: Adolph Gottlieb and his wife move to Brooklyn. November 4, 1933: The New York World-Telegram announces Barnett Newman to run for mayor of New York. November 7, 1933: Fiorello Henry La Guardia wins election for Mayor of New York. November 20 - December 9, 1933: Mark Rothko has his first NY solo exhibition at the Contemporary Arts Gallery. Late 1933: Franz Kline meets Martha Kinney. December 1933 - The Public Works of Art Project is founded. December 20, 1933: Arshile Gorky joins the Public Works of Art Project. Gorky was among the first group of 125 artists (which also included the future art critic Harold Rosenberg) who signed up to the Mural Project. He was paid $37.38 per week. 1933 - 1934: Arshile Gorky paints Portrait of Myself and My Imaginary Wife.